One of our contentions at the Hudson River Valley Institute has always been that you can go anywhere by starting exactly where you are. The closest I ever came to losing this argument was at a Teaching American History conference with a gentleman from New Mexico. &#8220It’s easy for you &#8211 the Hudson Valley has nearly 400 years of colonial history and documented prehistory before that,&#8221 he said &#8220all we have are aliens (Roswell) and those German POW scientists from WWII.&#8221 (He had just finished a presentation about the latter). But he went on to explain that even in that state’s most isolated towns, there was at least one war memorial with the names of local soldiers who served their country, and when they shipped out, they charted a course around the nation and the world leaving a path for students today to trace through history. ?In Poughkeepsie, the most elaborate memorial may be the Soldiers and Sailors Monument on Little Market St. Across from that monument is Adriance Memorial Library, where two original cannon from the USS Monitor are on display. Most of us learned about the battle of the Monitor and the Merrimack in grade school. Some of us have learned since that the USS Merrimack was converted by the Confederate navy into the ironclad CSS Virginia. 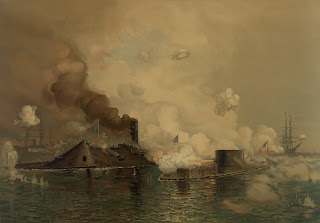 Larger than the Monitor and with more guns, it decimated the wooden fleet at Hampton Roads on the first day of the battle, March 8, 1862. But the Monitor arrived overnight and was able to use its shallow draft, low freeboard, and revolving turret to devastating effect the when the battle was rejoined the next day. It was a decisive victory for the Union and a turning point in naval technology.? ?One of the four champions and financiers of the Union’s first ironclad was John Flack Winslow. At the time, he was co-owner of the Albany Iron Works, living near Troy, NY. Once he successfully obtained the approval of the President himself and a contract with the Navy, he and his partners oversaw an accelerated construction project and the launch of their unique ship on January 30, 1862. Years later, Winslow would retire to a sylvan estate on the banks of the Hudson, on the north end of present-day Marist College Campus. Once here, he got involved in local railroads and presided over the bridge company that would eventually construct the Poughkeepsie-Highland Railroad Bridge: today’s Walkway Over the Hudson State Historic Park.? So here, amongst our region’s embarrassment of historic riches, is the nearly-lost tale of a local entrepreneur and patriot who was once heralded as a “benefactor of the nation.” All of it took to place Poughkeepsie at the heart of one of the most important naval battles in history was to read the plaque accompanying a cannon outside the local library. And you believed the gentleman from New Mexico about the limited history available in New Mexico? I’m amazed that New Mexico lets this man teach. Clearly, he doesn’t understand the history of his own state. and died to preserve the Union. I am probably guilty of over-simplifying my New Mexico friend’s statement – it was in the context of teaching American History at a specific grade level and may have been an issue of state standards. Besides that, I was too busy emphatically agreeing about the wonders of our own region…I guess I am a New Yorker after all! I’m sorry to have never seen the lighted fountain, but it is still kept in good repair and occupies a picturesque little triangular park on Little Market Street.